On my 2001 sunsetter vlx i was looking at the drivers side of the boat on the interior. The area where the netting is beside the driver seat on the side would be a great space to store a set of regular skis. 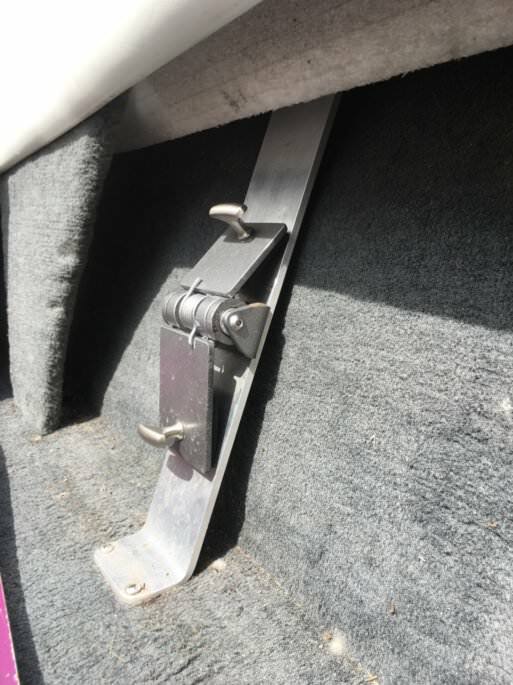 When i tried to slip a ski in there, the side panels got in the way where the driver seat is and where the rear bench meets up with that side. I did have a set of jr skis under the bench seat though that slipped into that side space pretty easy. Has anyone midified that side in order to put longer skis in there? Also, is there any type of ski holders that would work in there too? I have the ‘00 lxi and just bought the tower rack. I don’t know how that area behind the driver seat of the vlx looks but I couldn’t figure out how to mod my lxi to accommodate my ski. Pics? Do you have ballast? If not, it's probably easier modifying the port side under seat area to take skis. Not sure how'd you accomplish that on starboard in that boat. We don't have any bags or tanks in our '01. 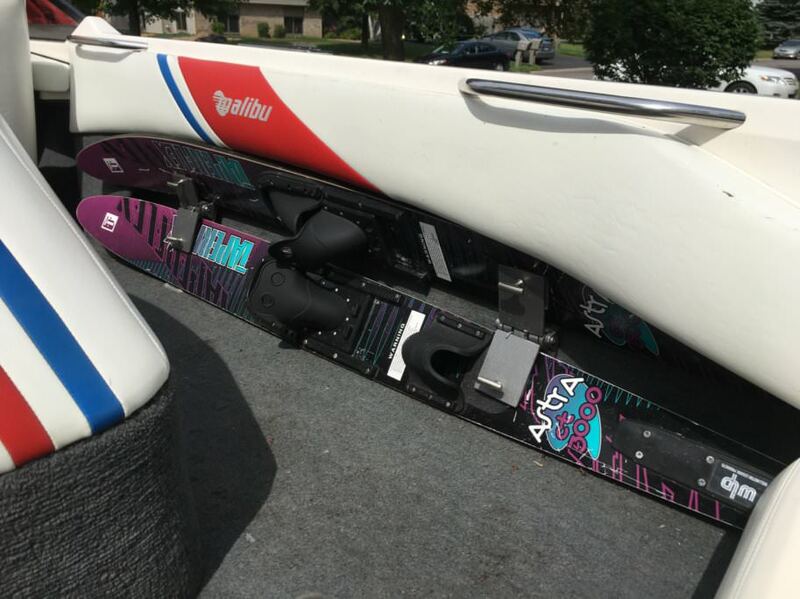 There's a pair of combos and an old Obrien slalom in the in-floor ski locker pretty much at all times. Boom lives under the observer seat, but that's another place you can put a slalom ski. The newer TXI's have some pretty sweet fold out racks, but I haven't had any luck finding them for purchase on their own. Plus there's no guarantee it would kick out far enough to clear your side panels. For now, I spent $20 on Amazon for a 1 inch thick cutting board that I'll notch to slide over the bottom of my side panels and then slip a ski into. 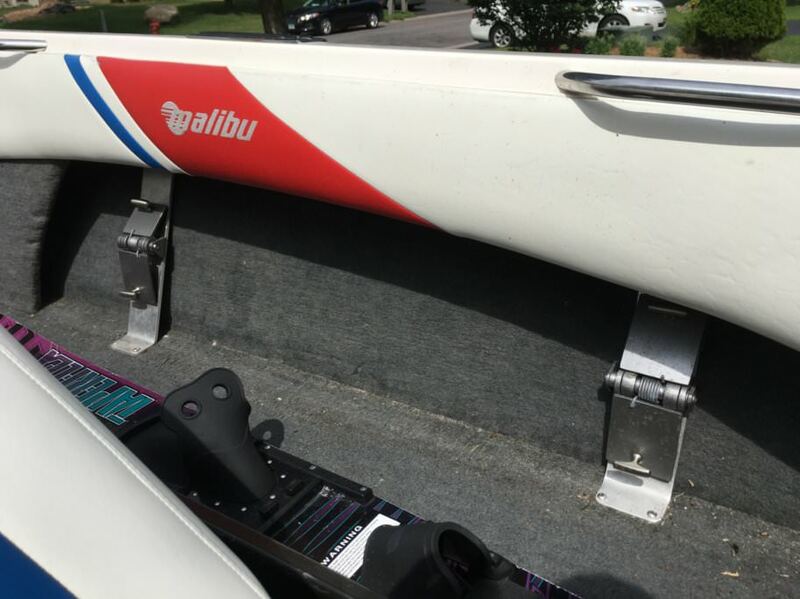 @williemon: As noted on the TXI, the latest generation MasterCraft Prostar also has a side ski rack, google some pictures for ideas. I don't think they are a for sale item but your creativity may come up with a solution. @jkskier has a good idea and one that is great for the frugal among us. If you attach his idea using a piano hinge, they could swivel/fold against the gunnel or down on the floor when not in use. Thanks for the ideas. I currently have all spaces holding items. I have 2 wakeboards, 2 knee boards, 2 sets of adult combo skis( one set is the generic big daddy) 2 slaloms and 1 set of jr combo skis. I also have 3 ski wake ropes, one tube rope, 2 anchors, boat tow rope, and 12 life jackets. Everything is stored easy to get to and use in the lockers and under bench seat. I moved the big daddys out from the in floor ski locker so i can put a ballast bag there. Just seems a shame that so much beam on the starboard side is empty open space that could hold something i use often. Like i said, i did put the jr combo skis there. Maybe i can put the ropes there as well. I saw the Mastercraft ski racks at the boat show, it gave me the idea to make these. I'm happy with how they turned out, they hold the skis in place well.